Digital Marketing (Online Marketing, Internet Marketing) has been an ever-growing marketing in the modern world. It has a well-developed structure highly required by the business to succeed and flourish exponentially. It has dominated the traditional marketing platform due to its effective technology features. About Social Media Marketing Training? Social Media Marketing (SMM) is one of the important components of Digital Marketing. It has been in demand due to its high usage among the internet users all over the world. Companies are using multiple social media platforms to increase their brand awareness by engaging with the customers. Social media platforms such as Facebook, LinkedIn, Instagram, Twitter, YouTube are currently being used by various companies to build their business successfully. What are the objectives of our Social Media Marketing Online Course? Our SMM Training Course curriculum has been professionally built by experienced trainers. Our SMM Trainer will cover all the important concepts and subjects in depth with current trends in the industry. The SMM Online Training by Digital BigClasses will develop student’s SMM skills and will make them professional SMM managers. The Digital Marketing Online Training will be taught only in 30 hours, respectively. The SMM Training consists of various Social Media Platforms, Advertisements and Analytical tools implementing and more. You will also be taught on designing creative and engaging posts on different platforms. What are the skills that you will be learning with our Social Media Marketing Training? Who should go for this Social Media Marketing Training Course? How will Social Media Marketing Training help your career? A company can increase their brand awareness by being present on the social media platforms. It will effect with a professional approach towards bonding with their customers. Customers can get the latest information on their favorite product and services with interactive posts. According to a source, more than 52% of the marketers increased their company’s revenue with the use of Social Media. Social media can increase the website traffic and also the Return On Investment (ROI). You can effectively target people with this technology. Every kind of industry can use Social Media Optimization to build their brand stronger on a competitive platform. Now, let’s see why one should learn SMM. According to a source, social media spending will increase by 150% by 2020. According to research, the social media users will increase us top 3.02 Billion by 2021. Instagram will generate accounts with more followers than other social media platforms. The average salary of a Social Media Manager is around 82, 000 $ in Singapore. Companies hiring Social Media Managers in Singapore are Global Spectrum PICO, Nanyang Technological University, United Overseas Bank Limited (UOB), and more. What are the pre-requisites for Digital BigClasses’s Social Media Marketing Training Course? Digital BigClasses will provide a certificate to the students who successfully completed their Social Media Marketing training. The certification will be provided within one week of the training completion. The Social Media Marketing Training is being provided by Mr. Suresh with 9 years of experience in the Digital Marketing field. The curriculum prepared is up to date, and is constantly revised with the industry standards year over year. The online training will teach you the important concepts and subjects of Digital Marketing based on real-time case studies. Projects and assignment will be given for in-depth understanding of a subject. Course materials and E-Books will be provided and is accessible for 365 days only. Workshops will be conducted for quick learning for Entrepreneurs, Business Men/Women, and Company Employees. 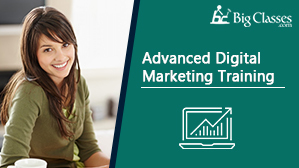 This is one of the best online training institutes to learn Digital Marketing, and its other components. The training was given in detail and didn’t leave any topics behind. I have learnt so much thanks to Digital BigClasses. If you want to learn how to promote your business using social media, this is the best institute to learn from. I am 45 y/o, and I didn’t know the importance of Facebook, LinkedIn, and etc. I made my accounts in all, and started talking about the business. The training promised to give real-insights on the social media marketing, and it did cover everything based on real-time events. I learned so much from the training. Thank you Digital BigClasses. Excellent course. Every best social media platforms were covered. From analytics, to creating ad campaigns, and etc. Everything was covered.